Certain parts of speech are integral. Nouns and verbs are needed to make a complete sentence. With a firm understanding of these parts of speech, we can move into the world of adjectives and adverbs. We have modifiers that dress up the most integral parts of our everyday language. Adjectives, in particular, pair up with nouns. It's their job to modify nouns, pronouns, and even other adjectives. This takes us from "the girl" to "the pretty girl." Given their importance, there are several different types of adjectives. Let's dive right into this multifaceted world. She wore a pink and yellow top yesterday. 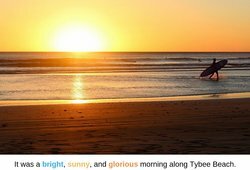 It was a bright, sunny, and glorious morning along Tybee Beach. Their murder was a sad, sorry, gruesome affair. Just be careful when you're piling up words before a noun. For example, "blue hospital gown" doesn't have any commas or the word "and." That's because "blue" is modifying "hospital gown." If in doubt over two words that could possibly be modifiers, place the word "and" between them. If it doesn't make sense, know you're dealing with a descriptive adjective and not a coordinate adjective. Would you like this bicycle? That car used to be mine. I don't want these accolades. The silly dog rolled around in the filthy mud for hours. She's such a nice cashier. He hurt her feelings when he labeled her an annoying sister. I don't like any liars. She bought every handbag in that store. I don't want any backtalk. Do you have many openings? There are no books in this library. What color do you want to paint the cottage? Which kimono do you want to order? Whose land are we standing on? Each interrogative adjective needed a noun after it. There are other words that pose a question, such as "who" and "how," but they can't be adjectives because they don't modify nouns. For example, you can say, "Whose land are we standing on?" But, it would be incorrect to say, "Who land are we standing on?" or, "How land are we standing on?" I'm sorry; I didn't know this was your Lamborghini. Those possessive adjectives are immediately followed by the noun. If you would like to eliminate the requirement of the corresponding noun, you need to change the adjective. Only "his" stays the same. The red car over there? It's ours. I've got my ticket. Where's yours? Notice each of these adjectives is modifying the subject of the sentence - "she," "we," and "they." They're trickier to spot because they come after the verb, instead of before the noun, but they're still a member of the adjective tribe. She's going to a Shakespearean festival. Well, that was a Freudian slip. In the near future, I hope to have six puppies. In fact, I'll take the whole litter of puppies. As an aside, when writing numbers, it's generally accepted practice to write out the numbers zero through nine and use numerals for anything 10 and above. This is my fourth doughnut. He ate the third hot dog. This is Lexi's fifteenth sweater. I'll watch the later show. Remember that, when a number or a sequence is being allocated to a noun, you have a sequence adjective. Don't take away the iguana. Definite article: This article points to a specific item, as in the iguana, the glass, and the amphitheater. Indefinite articles: These articles point to non-specific items, as is the case with an iguana, a glass, or an amphitheater. Have you ever heard someone's writing referred to as "flowery"? Basically, they loaded it up with descriptors - most likely adjectives or adverbs - and made their writing clunky. Of course, we're here to reach a certain level of grammatical genius, so it's good to understand all these subcategories. Just consider the amount of adjectives you sprinkle into your writing. Like anything else, you don't want to go too far. With that in mind, put some of these adjectives in your back pocket. Perhaps one of them will serve you well in your next short story or poem. "Types of Adjectives." YourDictionary, n.d. Web. 24 April 2019. <https://grammar.yourdictionary.com/grammar/adjectives/types-of-adjectives.html>. Certain parts of speech are integral. Nouns and verbs are needed to make a complete sentence. With a firm understanding of these parts of speech, we can move into the world of adjectives and adverbs.We have modifiers that dress up the most integral parts of our everyday language. Adjectives, in particular, pair up with nouns. It’s their job to modify nouns, pronouns, and even other adjectives. This takes us from “the girl” to “the pretty girl. "Given their importance, there are several different types of adjectives. Let’s dive right into this multifaceted world.